The last week of January attracted more than 30 underwater photographers from around the world to take part in the inaugural Dive Chronicles' Digital Jam. 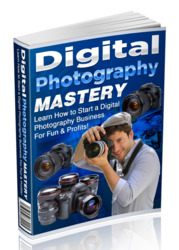 Digital Jam is a combined digital photography workshop and competition, offering $20,000 worth of prizes. Two dive centres were involved in this inaugural year: Ocean Frontiers at the East End of the island and Dive Tech based in West Bay. Each centre laid on a week of special photographer friendly diving, combined with lectures and workshops, with on hand advice from resident host photographers. The Dive Tech group was lead by Geri Murphy, one of the world's most successful underwater photojournalists, and the Ocean Frontiers group by UWP contributor, Alex Mustard. 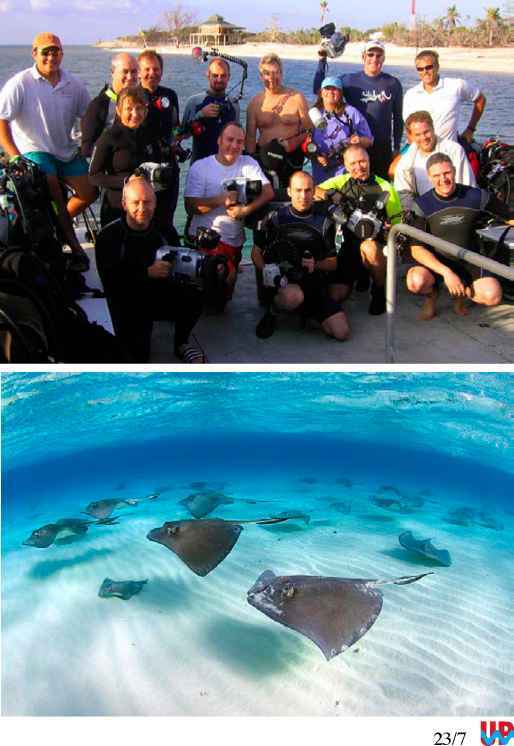 "It really was a special week; great company, great diving and great photography," Alex told UWP. "It was very refreshing to be teaching pure digital - the technology means that you can teach underwater photography in a completely different way. My course wouldn't even have worked for film! I was also able to take the gang to some of my special sites, including a dawn dive with a school of 80 stingrays at the Sandbar. 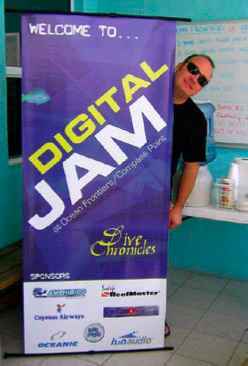 The Digital Jam sign, with host Alex Mustard. Top right. The Digital Jam group at Ocean Frontiers. Right. Schooling stingrays at dawn at the Sandbar. The whole school numbered 80. Photo by Alex Mustard. "Dive Chronicles and the other sponsors laid on all sorts of diving gadgets for us to try throughout the week: Sealife digital cameras, Oceanic MP3 players and dive computers, DUI BCs and Amphibico video cameras. 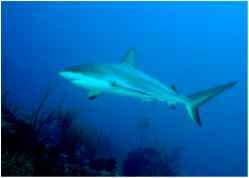 This classic and natural Caribbean Reef Shark portrait won the wide angle for SLRs category. Taken by Ingvar Eliasson. the week's images judged by Cathy Church, with Geri and me. I am very proud to report that my group won 6 of the 7 categories, with prizes including trips to Papua New Guinea, Wakatobi Indonesia and the Bahamas and kit including a dive computer and an underwater metal detector! The week was about far more than prizes. It was first and foremost a fantastic week of photographic diving with like-minded people. But maybe I am just saying that because I didn't win a prize!" You can see all the winning images from Digital Jam 2005 on the Dive Chronicles website www.divechronicles.com. Next year's Digital Jam is already scheduled for January 2006. Contact [email protected] ontiers.com for more details.